Joanna Penn Cooper // Writer, Teacher, Editor. Joanna Penn Cooper is the author of The Itinerant Girl's Guide to Self-Hypnosis (Brooklyn Arts Press, 2014), a book of lyrical prose vignettes, andWhat Is a Domicile (Noctuary Press, 2014), a book of poetry. Her recent chapbooks are When We Were Fearsome (Ethel Zine Press) and Mud Woman, a collaboration with Rebecca Bratten Weiss (dancing girl press). Joanna holds a Ph.D. in English (American literature) from Temple University and an MFA in Poetry from New England College. In her teaching career, she has held full-time visiting positions at Marquette University and Fordham University. Joanna currently works as a freelance editor; serves as an editor at Trio House Press; co-edits the literary zine Ethel; and teaches online workshops in flash memoir and lyric essay for the journal Creative Nonfiction. She is a staff writer for Good Letters, the blog of Image Journal, and her work has appeared in The Academy of American Poets Poem-a-Day feature, as well as South Dakota Review, Zócalo Public Square, Open Letters Monthly, Poetry International, and other journals. She lives in Durham, North Carolina. Joanna has worked with writers in business, the academic world, and the arts. 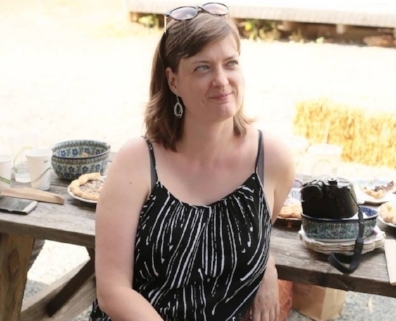 In addition to her work as an editor of poetry and creative nonfiction, she is an experienced editor of scholarly articles, business proposals, artist statements, and website copy. If you are interested in editing services or manuscript consultations, contact Joanna for rates and availability.